November 21, 2018, 6:00 p.m. 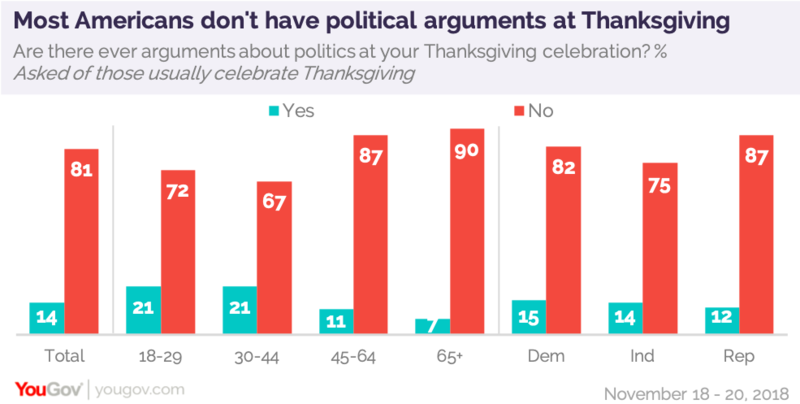 There will be political arguments around some Thanksgiving dinners this year, but not for most of those who celebrate the day. Their arguments may be more about who gets white meat and who gets the dark meat, at least according to the latest Economist/YouGov Poll. Just 14% of those who celebrate the holiday (90% of Americans say they do) admit there are ever political arguments at their dinner table. Perhaps Americans learn how not to argue with age: those under the age of 45 are three times as likely as those 65 and older to report political arguments. But there isn’t that much difference between Democrats and Republicans when it comes to expecting arguments. That doesn’t mean there isn’t political disagreement around the dining table. It just may come without arguments. 29% say that the people they spend Thanksgiving with mostly agree with them about politics. 43% say people mostly disagree, or that there is both agreement and disagreement when it comes to politics. But most say they just won’t discuss politics. 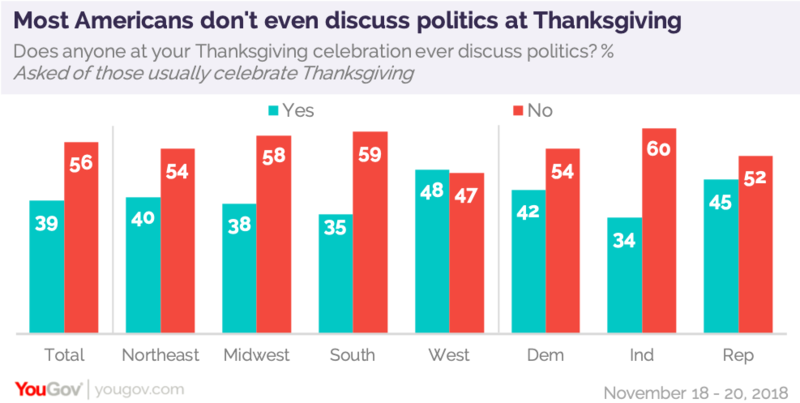 A majority of both Democrats and Republicans (and even more independents) say they don’t discuss politics at Thanksgiving. There is more political talk in the West than in any other region. For most, Thanksgiving is a time for sharing with others: 59% say they and their family invite people who might otherwise be alone on Thanksgiving to share their meal (women do this more than men do, and this is a bipartisan effort). 88% of Americans are thankful this year, and they are six times as likely to call themselves thankful than less thankful when they compare this year to last year. Thankfulness increases with age: 97% of those 65 and older are thankful, compared with 78% of those under 30. But most celebrants keep what they are thankful for to themselves; only one in four announce what they are thankful for at the Thanksgiving dinner table. Politics still matters when it comes to being thankful this year, though not as much as it did in 2016. In fact, both more Republicans and more Democrats say they are thankful this year than were thankful in 2016, just after the presidential election in which Donald Trump defeated Hillary Clinton. 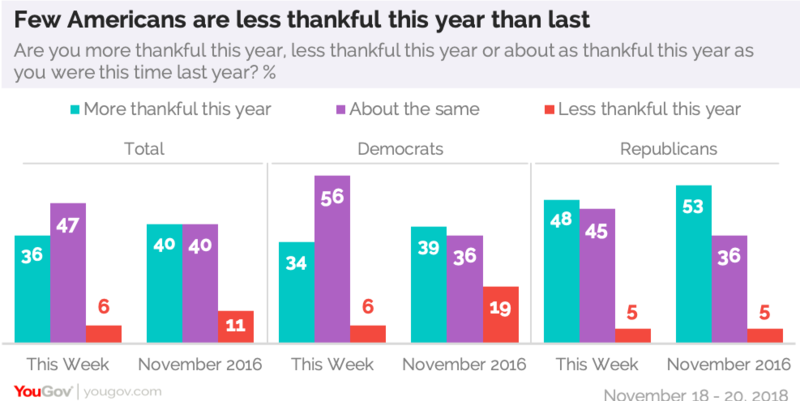 This year, just 6% of Democrats say they are less thankful than they were last year; in 2016, 19% of Democrats said that. More Republicans than Democrats now, as they did in 2016, say they are more thankful than before. But the gap has narrowed. 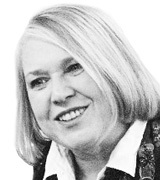 Both parties may have found something in the midterm election results to be thankful for. One reason that politics may take a back seat at Thanksgiving is that many Americans are occupied with sports that day. One in three (39% of men and 27% of women) will be watching football (and half of that group will be watching during dinner). That certainly helps take the focus away from politics. But Thanksgiving is also about eating. And there are almost no political differences when it comes to what to eat. White meat is more popular than dark meat by more than two to one, among Republicans, Democrats and independents. About a third say they like them both, but there will be competition for the finite amount of white meat on a typical turkey. Very few respondents say they don’t eat turkey. In fact, just 5% of adults call themselves vegetarians, and another 2% are vegans. There are more in the Northeast than in any other region and more under the age of 30 than in any other age group. Overall, 7% say they used to be vegetarian or vegan at one time, but are no longer. By two to one, Americans like cranberry sauce – and Americans prefer the canned variety. Only in the West is cranberry sauce made fresh as popular as canned. 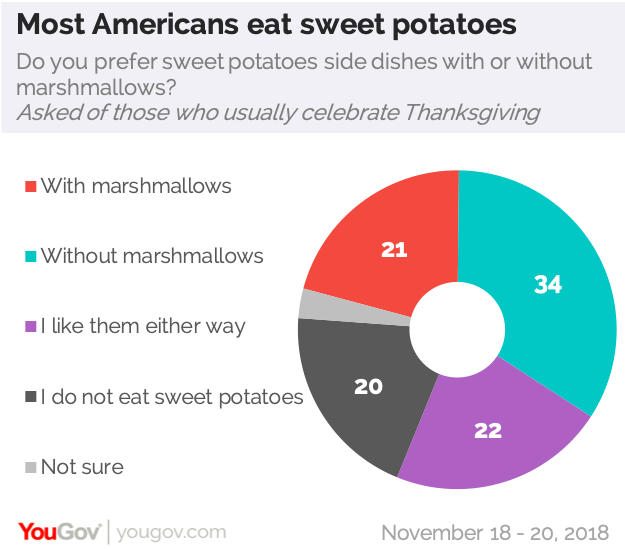 Sweet potatoes do split the parties: Republicans are evenly divided on whether they like their sweet potatoes with or without marshmallows, while Democrats prefer them without. There are regional differences here, too. Northeasterners are more likely than those elsewhere to favor sweet potatoes without the marshmallows.